The wine map of Tuscany has changed dramatically in the fifteen years since I was writing my previous book on the region. Back then the focal points were Chianti Classico and its peripheral sub-zones, and the twin hilltop towns of Montalcino, for Brunello, and Montepulciano for Vino Nobile. What lay beyond, the untapped land of the Maremma, was a rural backwater. In Bolgheri, Sassicaia stood virtually alone, while Ornellaia was a mere building site. Further south, Pitigliano was dominated by the village cooperative, whilst nearby Scansano boasted just four independent producers.How things have changed. Suddenly the Maremma has captured the interest of those seeking to expand their vineyards, be they Tuscans, Italians from other regions, or foreigners. Take Bolgheri first, which over the intervening years has established a firm place on the international wine map for some of the most successful Bordeaux blends outside the Gironde. Sassicaia, a highly successful blend of Cabernet Sauvignon and Cabernet Franc, was the pacesetter, under the auspices of a powerful combination of personalities: the owner of the estate, the Marchese Incisa della Rochetta, his cousin Piero Antinori, and Antinori’s oenologist, the talented Giacomo Tachis. Sassicaia made its mark as one of the very first Italian wines to be aged in small French barriques rather than the large traditional botti, made of Slavonic oak. Next came Pier Mario Cavallari at Grattamacco, and then Piero Antinori’s brother, Ludovico, created Ornellaia, planting Merlot and Cabernet Sauvignon around a state of the art winery that wouldn’t look out of place in California. Massetto, a 100% merlot from Ornellaia, has become a “cult wine”, and in 2002 Antinori sold-up to Robert Mondavi. More people are recognising the suitability of Bolgheri’s maritime climate for Cabernet Sauvignon and Merlot, and other names to seek out are Michele Satta, le Macchiole and Enrico Santini. Even Angelo Gaja is making wine here. The adjoining DOCs of Montescudaio and Val di Cornia, with its sub-zone of Suvereto, have followed in the footsteps of Bolgheri, turning away from Sangiovese as the traditional grape of central Italy, to include Cabernet Sauvignon and Merlot as an intrinsic part of the blend. The land around the attractive hilltop town of Suvereto seems particularly suitable, with two very successful estates, Tua Rita and Gualdo al Re, though others are following in their wake. It has all happened very suddenly; the first vintage of Tua Rita was 1992, and like so many Italian wine producers, Rita Tua, has a cavalier attitude towards DOC regulations, usually preferring to label her wine as an Indicazione Geografica Tipica (IGT), so that she has the freedom to use the grape varieties that she likes. In some ways it is further south that the changes have been even more dramatic. It was Erik Banti, one of the early pioneers of Scansano, who summed up the transformation most aptly when he observed that twenty years ago his neighbours were sheep, whereas today they are the likes of Antinori, Mondavi, Frescobaldi, Gaja and a host of other well known names on the international wine scene. Suddenly the suitability of the Maremma for grape growing has been realised. The climate is warmer and more clement than in the heart of Tuscany, and grapes ripen here much more easily than in the hills of Chianti Classico. Scansano is at the heart of that development, attracting an influx of new producers, the likes of Jacopo Biondi Santi, Masi, Bolla, Baroncini and Strozzi Guicciardini. Not only are existing DOCs being developed, but new ones are being created, with a veritable spawning in the province of Grosseto, so that there is no area remotely suitable for vines that is not included in a DOC. Only the slopes of Monte Amiata, Tuscany’s highest mountain, remain untouched. photo: Castello di Montepo near Scansano, © CephasMorellino di Scansano was the first, with Morellino (the local name for Sangiovese), forming a pair with adjoining Bianco di Pitigliano. The tufa soil around the dramatic Etruscan town of Pitigliano is particularly suitable for white grapes. However nearby Sovana, another charming Etruscan town, now boasts a DOC for red wines and Piero Antinori is planting extensive vineyards there. Closer to the coast there is Parrina, an older DOC, thanks no doubt to the political aspirations of the owners of the eponymous estate, which virtually accounts for the entire DOC. That in turn is surrounded by the vineyards of Capalbio, named after the fashionable hilltop village, whose cooperative dominates production of that DOC. And then there is Ansonica della Costa Argentario, which includes the coastal vineyards, as well as the promontory of Orbetello and the island of Giglio. This is where the little known white grape variety of Ansonica, found more commonly as Inzolia in Sicily, comes into its own to produce some delicate but original flavours. A little further north, two areas which hitherto had produced Vino da Tavola have now been given a more positive identity. Monterregio di Massa Marittima covers vineyards around the beautiful town of Massa Marittima, which boasts one of Tuscany’s most enchanting piazzas and is also home to some of its best panforte. Although the new DOC is based on Sangiovese, grape varieties such as Merlot, Syrah and Cabernet Sauvignon may also be included in the blend. And last but certainly not least is Montecucco, which is also attracting considerable investment from outside the region, notably at Colle Massari. And existing small producers are suddenly realising the value of their land, for the northernmost vineyards of Montecucco are separated from the prestigious name of Montalcino by one small river valley. Who can blame them for considering the difference to be relatively insignificant? 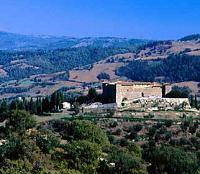 While the reputation and price of wine such as Brunello di Montalcino, Vino Nobile di Montepulciano, Chianti Classico and Bolgheri are firmly established, there are still little known treasures to be discovered in the hills of the Maremma; wines that convey the flavours of Tuscany, with the traditional taste of Sangiovese, blended with the more international notes of oak aged Cabernet Sauvignon and Merlot.